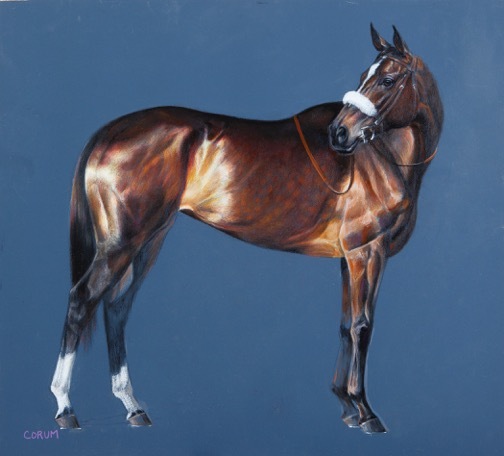 Zenyatta, Secretariat, Totillas — two of these three world-famous horses Jaime Corum has already painted, and one is on her bucket list to paint in the future. Jaime painted Zenyatta on a canvas that was 7 ¼ feet high by 12 feet wide. 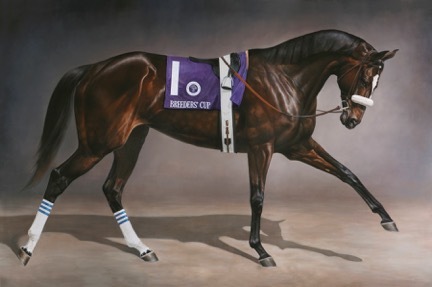 It was so large that a commercial horse trailer was used to ship it to Santa Anita to Zenyatta’s owners, who had requested it for a special celebration of their famous mare. Jamie with her furry family, Sandy and her dog George. Jaime can’t remember a time when she didn’t want to have a horse. “I would draw them and draw them and draw them!” she said. In fact, she drew so many horses that when she was in high school, she realized that she was actually pretty good at drawing horses. 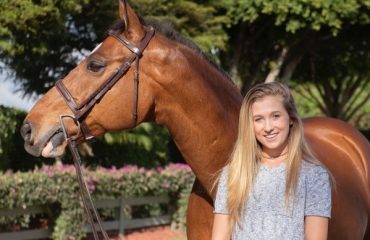 Jaime started riding at a riding school outside of Louisville, Kentucky, when she was 11, joined Pony Club and began competing. 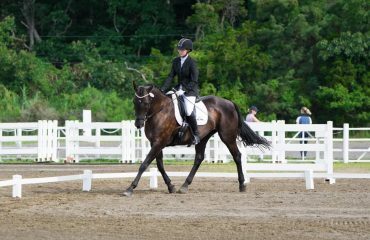 “I was really into eventing and leased horses to ride,” she said. When she started college at Bellarmine University, where she studied art and where she teaches art today, she quit riding. 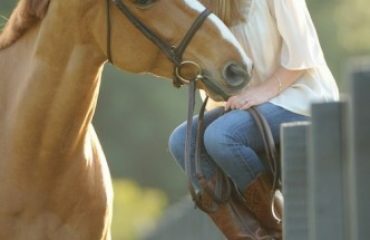 It wasn’t until 2000, after she’d received her Master of Fine Arts degree from the University of Kentucky, that she started riding again at her original riding school. 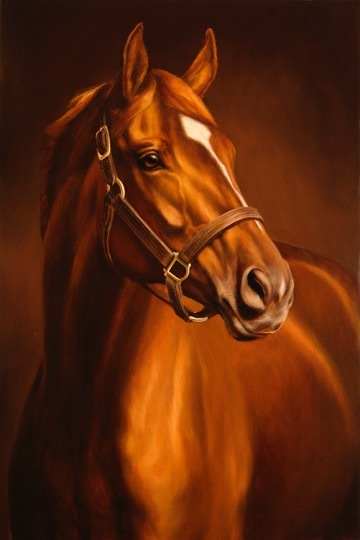 “I realized then that I couldn’t be a good equine artist if I wasn’t around horses and riding. 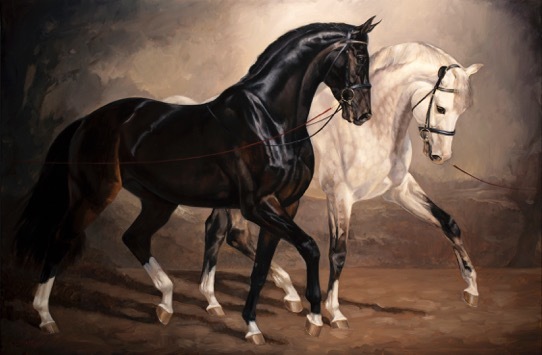 I needed to know the conformation of a horse, how to recognize and illustrate their individual personalities, how the tack or braids should be for various disciplines,” she explained. 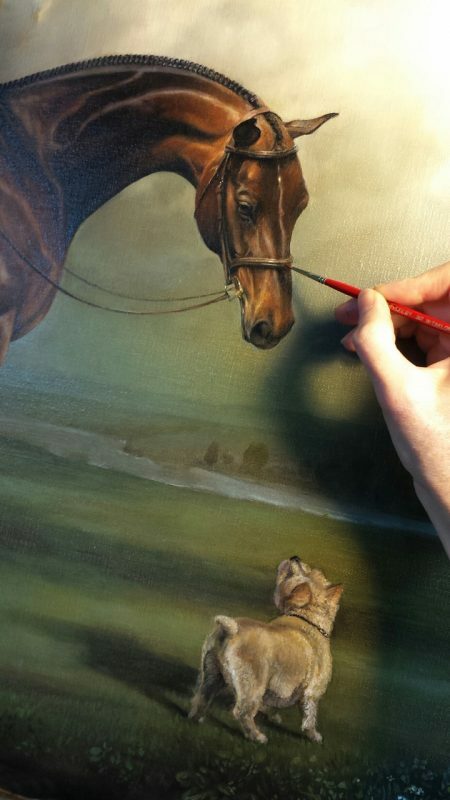 Jaime works on a portrait of Gabi and Izzy. Presently, Jaime’s artwork is featured in the Kentucky Fine Art Gallery in Louisville, Kentucky, New Editions Gallery in Lexington, Kentucky, and Tilting at Windmills Galleries in Manchester, Vermont, and Saratoga, New York. At Derby time in May, she has had showings of her artwork at The Brown Hotel in Louisville, and will show there this year, too. Painting or riding? Riding or painting? When is she the happiest?